The relay and fusible Link are actually waterproof & that is very heavy gauge wire. 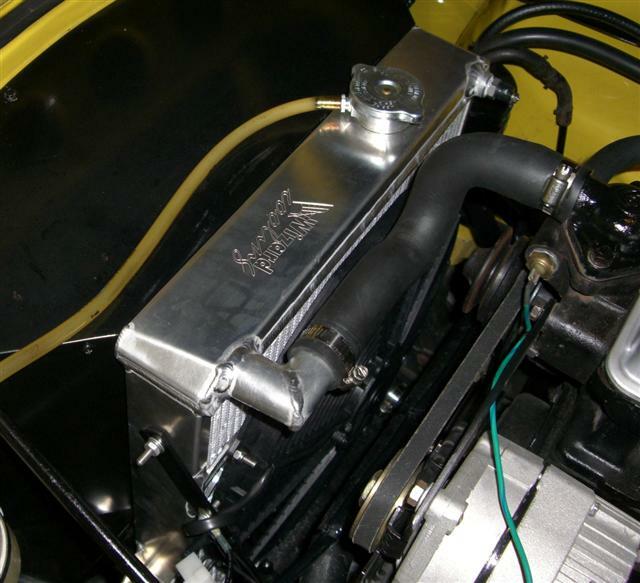 Custom Brackets make for an easy and secure mounting of the fan. So far so good. 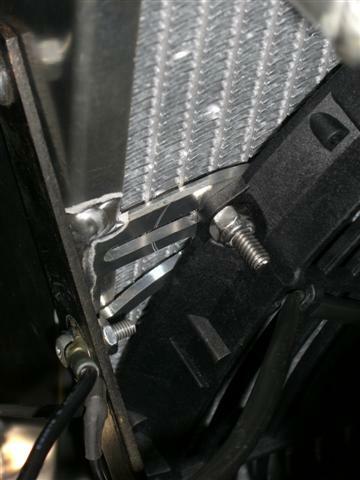 The fan drops right on to the bracket bolts and nyloc nuts keep everything nice and secure. 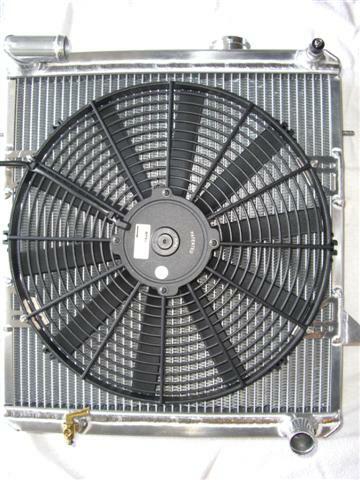 So how about the radiator........is it is nice as the fan? OK..... on to the installation. I had previously sent the Spal wiring instructions to see if Dan Masters had any advice on tying the Spal Harness in to his master wire harness that I have on my car. 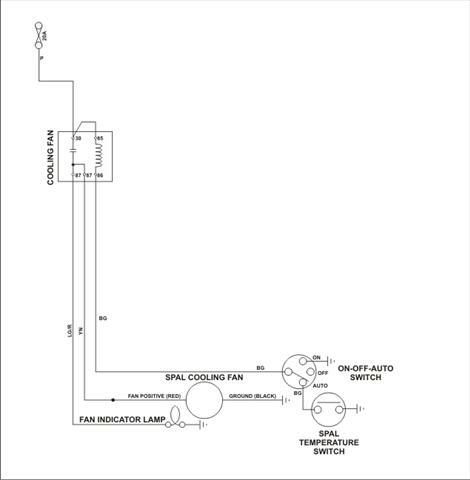 I was concerned as I'm using a 3-way fan switch (auto, off, on) that I wanted to retain with the new set-up. Dan's email was short, concise and included a schematic. Basically, he told me to toss the Spal harness as Dan's harness already has all the same components. 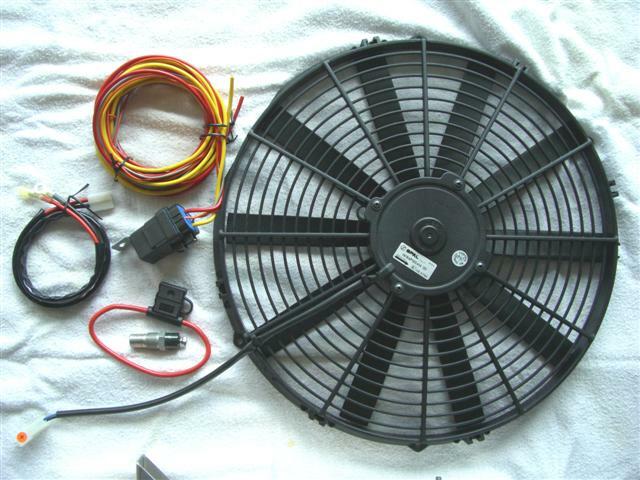 All I had to do was connect one wire to the fan's red wire and one wire to the temp sensor............... and the best part was that those wires were already run to the front of the car for my old Hayden fan. That was easy. 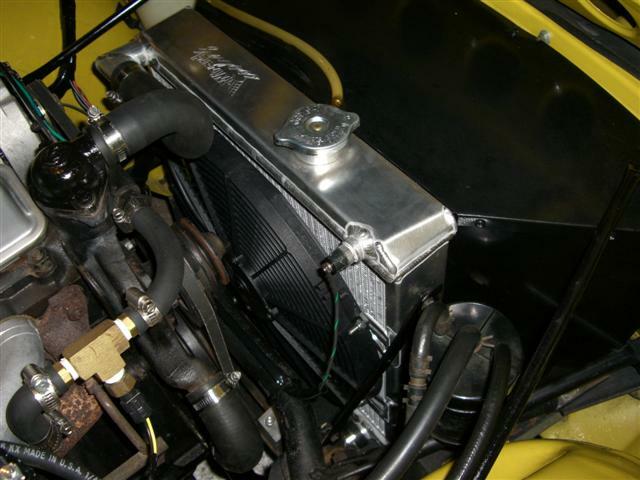 So it was finally time to put the radiator in the car. 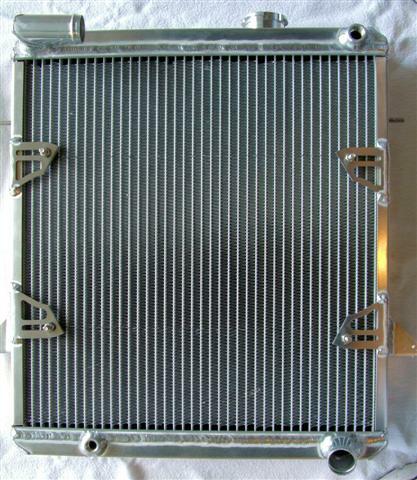 But first...........it's time for a "weigh-in": the original radiator comes in at 18 lbs 3 oz while the new aluminum one is 13 lbs 10 oz. OK, another 5 pounds removed from the car! I bought a petcock from NAPA, installed it in the provided bung and dropped everything in the car. Perfect fit! I hooked up the top and bottom hoses and poured about 1/2 gallon of anti-freeze in to check for leaks while I finished the rest of the installation. After about 20 minutes I noticed a few drops coming out of the petcock, so I flushed it a little and tightened it again. Back to work on the rest of the installation. 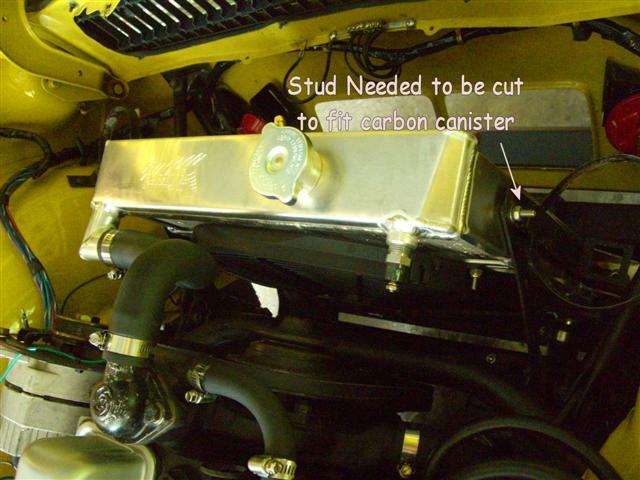 Two minor problems cropped up: the top side studs are a smaller size and the right one interferes with the carbon canister. So it took me about another 30 minutes to get everything on, including the fan shroud. Time to check that pesky petcock...... freakin thing is still leaking but...........what's that other drip! 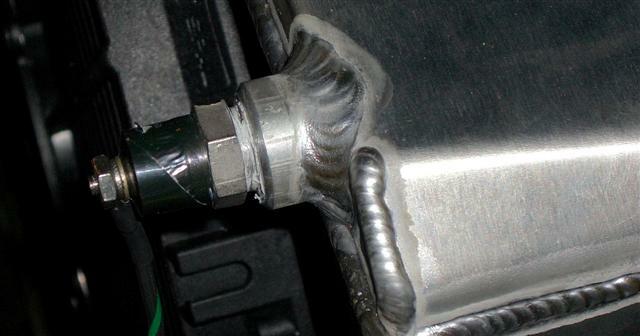 There on the edge of a seam, in the middle of a weld is a teeny tiny drop of anti-freeze. I wipe it up and feel around the lower hose but that's dry as a bone. As I lay there I can see the drop begin to form again, wipe it, wait a while and there it is........... a leak! So here's where the terrific customer service from Wizard and the great personal service from Art comes in to play. Art actually lives about 10 minutes from the Wizard Cooling factory, so he talked/walked my problem through. Bottom line.....they gave me their UPS number and I sent it back on Friday of Labor Day Weekend. They got it at 1:45 on Wednesday, fixed the leak, locked down my temp sensor, tested everything (bad petcock!) and shipped it back 2nd day (got it Friday) so I'd have time to install before the Connecticut Triumph Register Show. Now THAT'S CUSTOMER SERVICE! So here's what it all looks like once installed..... oh yea.... I also got a different petcock that doesn't leak. The Temp Sensor all hooked up! 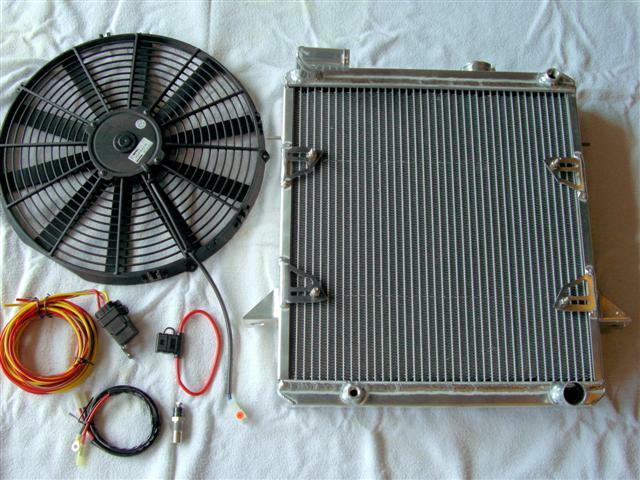 Bottom line...........this is the same radiator that TRF is selling without the fan or fan brackets. Drop Art an email and you won't be disappointed. Great price and personal service. You can't asked for more than that.